A trending area of research is the impact of fatigue on performance in critical situations such as operating a vehicle. The figure below suggests the impact of fatigue on both cognitive workload and performance. As shown, performance deteriorates with fatigue (bold solid line versus solid line). Numerous studies have confirmed this relationship. 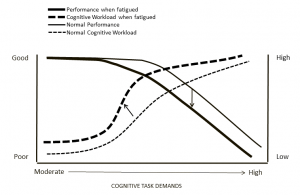 What is novel here is the hypothesized impact of fatigue on cognitive workload. Unlike what might be expected, workload rises as fatigue increases. Think of driving when you are starting to become fatigued: you know it and you are fighting to remain alert. In fact, you are recruiting additional mental resources to combat the fatigue effects. The result is a rise in cognitive workload.